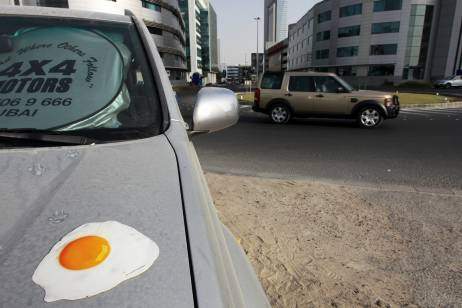 Uae &Me Media: Hot enough to fry an egg? Hot enough to fry an egg? Have you ever wanted to try out how hot the hood of your car really is with that cartoon tried test of frying an egg of the hood of your car? Well, The national has reported that a campaign was launched yesterday, that is part of the RTAs initiative to get people out of their cars and into the metro. They had planted realistic looking eggs (Sunny side up) on to the hood of around 3500 cars around Dubai Media City. With temperatures going above 50 degress celcius it wouldnt be too hard to believe! Ambient advertising for the win! But if I looked at an egg on the hood of my car, I wouldnt make the connection. I'd probably try to eat it. What else is there to support it? It's a really cool idea though. "The small lettering on the egg white read: “It’s a cool 20°C on the Metro”." I wonder how I would've reacted if i thought people were frying eggs on my car! Long live the printed word!